What is Taekwondo Step Sparring? Step sparring is a form of drill training used by Taekwondo students to practice and perfect basic stances, blocks, strikes and kicks with a partner. It includes one-step, two-step and three-step sparring, which are characterized by the number of steps forward that the attacker takes at the beginning of the technique. Because step sparring is a series of arranged movements, it is a good way to perfect your technical execution of basic movements through repetitious practice with a partner. It helps you develop distance control, timing, accuracy, self control, respect toward your partner and teamwork. At the advanced level, step sparring sets become longer and more complex, helping you develop coordination, speed and fluidity. You can use sparring or self-defense skills or a mix of both in step sparring. Depending on the type of skills you are practicing, you may begin from ready stance or fighting stance. However, step sparring techniques should not be confused with sparring or self-defense techniques. 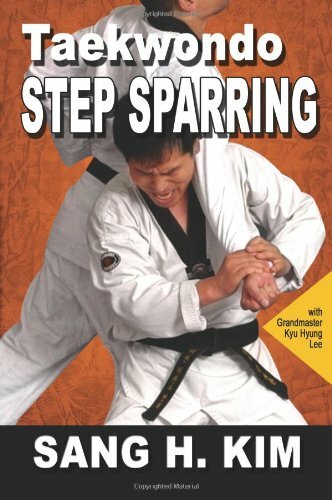 Step sparring is an excellent way for beginning and intermediate students to learn the basics of Taekwondo, including fundamental blocks, punches and kicks, used in free sparring and self-defense. Step sparring helps you learn how to control the distance, speed and power of your movements by practicing in a light or non- contact situation. This sense of control is critical for safety and technical perfection in sparring and self-defense practice in the dojang (school). Drilling in the form of step sparring is also a good way to reduce the fear of being injured during partner practice. An accurate sense of distance and spatial awareness is essential to developing self-defense and sparring skills. By repetitively practicing movements with a partner, you learn the exact range and angles of your kicks, punches and blocks. This knowledge can then be applied to developing accurate striking distances for free sparring. Once a step sparring set is learned, you anticipate what attack is coming and can accurately calculate how to correctly time your defense. Through repetition, you will develop an innate sense of defensive timing. As step sparring skills progress in difficulty, they become more complex and require you to perform up to a half dozen movements in a quick combination. This develops both the speed of the individual movements and the fluidity of the transitions between combination movements.